Is there anyone here that is into Duplo (and isn't under the age of 5! ).I have recently become a bit of a fan and was wondering if there is an afol off shoot - afod? 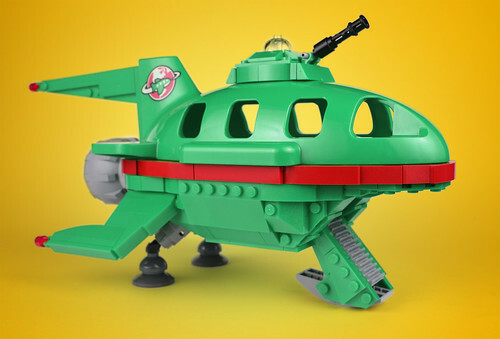 Is there anyone who does Duplo moc-ing etc? I bought a load of duplicate castle about 8 years ago and it still occasionally comes out, especially when all the neighbours kids come around. 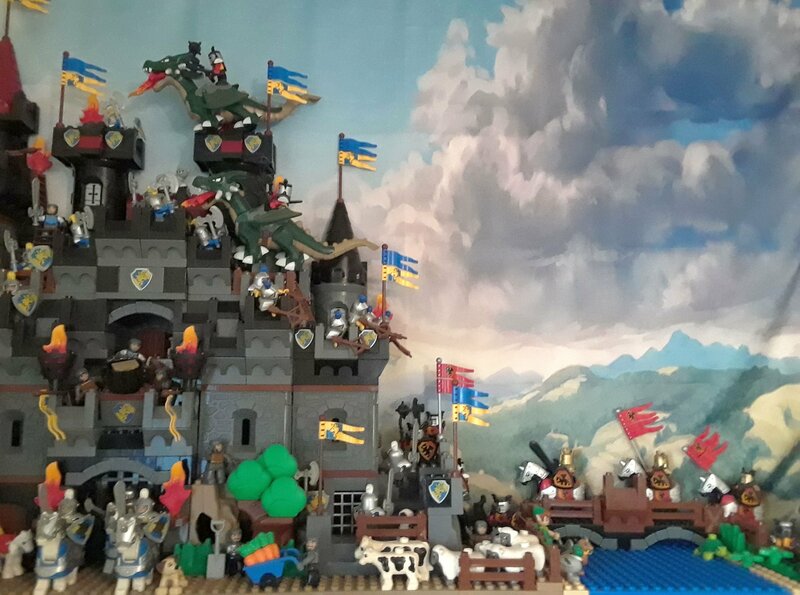 It quick to build and less mess than Lego, plus you can make eight foot high castles really easily, ideal for team racing. Me! In fact, it was the DUPLO Castle line that brought me back to LEGO! I love how fast you can build something big and impressive! And I also quite like the figures, and that all the decorated pieces are printed. One day, I want to build a whole DUPLO kingdom! Here is part of my current DUPLO castle shelf. Wow that duplo castle is impressive!! Been collecting a few sets here & there for the grandkids to get them into lego. I found a large carrier bags worth of Duplo today in a charity shop. Had some random bricks, vehicles, half a Bob the Builder set and the most adorable Circus Train. Really nice find. The more I build with Duplo the more I think it might be my new Favourite Thing. I buy them for my kid (who is 1) to play with. I only bought one set new (a truck), but I've gotten a number on Craigslist, a yard sale, and on-line auction. He is getting a train set for Christmas or Birthday - and that's probably it for new sets. He has quite a pile now - but if I see good deals on used stuff somewhere, he may get more. You guys are so lucky to find Legos and Duplos in thrift stores. 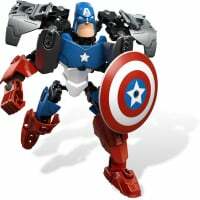 The ones around here largely have Megablocks and other junk - and very rarely, if ever, the good stuff. It does seem that Duplo will be more likely to be sold (or passed on to younger children of friends/family etc) rather than people just giving it away. It is a rare find. I feel very pleased with myself for finding it!! By the time I am ready to dispose of them, I think the amount of Duplo we will have sitting around will be a sizeable amount. Seems fairly unlikely I will be giving them away. But that's also true of the Lego. But also - they ARE compatible. It may be worth keeping the big blocks around for large wall structure "fill". 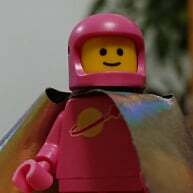 ^All great points about DUPLO, but when your children span the ages of 12, 3, and 2 - the youngest wants no part of DUPLO when the oldest is building modulars, and playing with those cool little figs where the parts can be changed out. 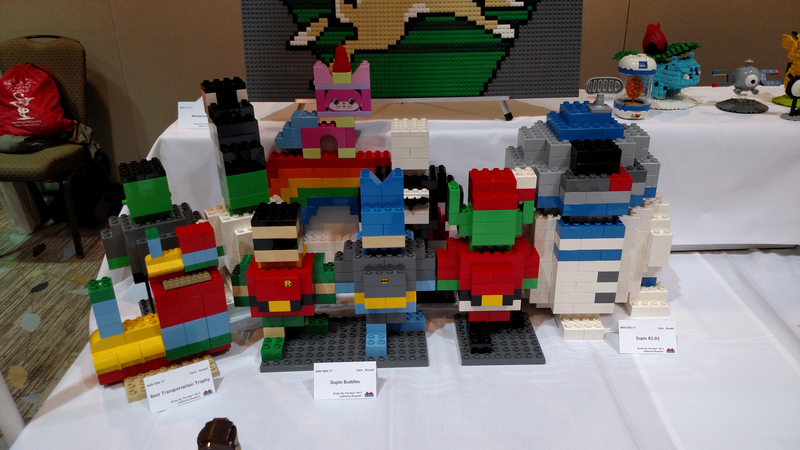 Here is a group photo of all my current Duplo MOCs. Russell: When the little ones in the hood see this photo, they will run to your place to play! I take a gallon bag or so of mostly used Duplo every time I visit my granddaughter, and she adores building with them. Every day I pull a few out of the bag, which I have to hide or she will raid my suitcase and find them all at once. We do wonderful builds on their living room floor, and her creativity at age three astounds me. It is so much fun. 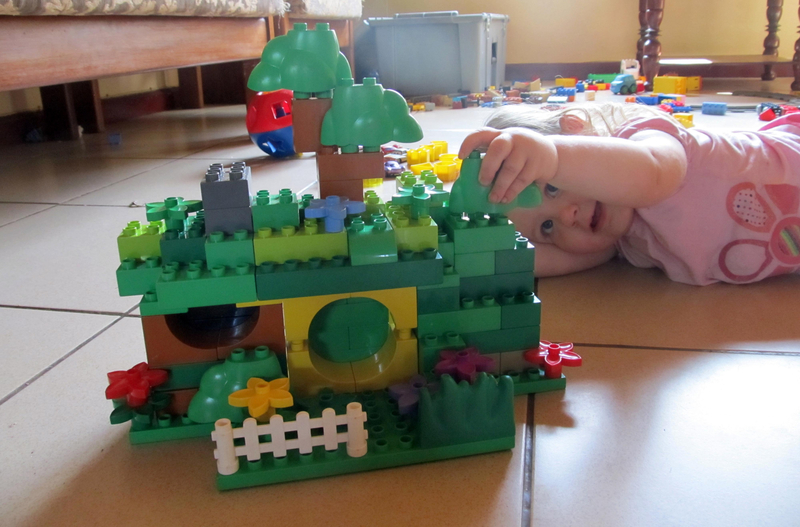 Now I have to build something else before I Skype her, so that is a real incentive to keep the Duplo out. Once I post some photos, I will link them to this thread. 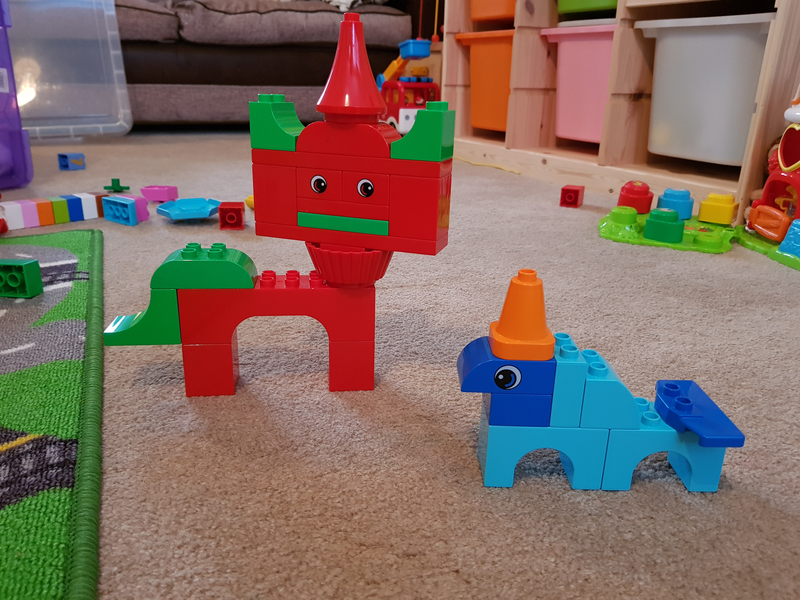 The things I love the most about building with Duplo is that they are very easy on the hands, especially if you have arthritis, and they are quite easy to see and pick up off the floor BEFORE you step on them. Duplo make me feel joyful and childish and bring me closer to my grandchild. Can't wait to Skype her again after I build something else because she is back in China for a while and the relatives there can see what I am building, too. I can't imagine getting rid of the bulk of my Duplo even after (hopefully) other grandkids arrive and grow out of them. There is no reason adults can't enjoy Duplo! For anyone considering getting into Duplo, GO FOR IT! I collect the Duplo Pirate sets, and also have a few other Duplo sets too. While I do not normally use Duplo in a MOC, I may use the occasional piece in my builds. That said, I want to build a very large LEGO MOC mega suspension bridge between 2 tables. If and when I build this bridge, I was going to use a hell of a lot of Duplo for the towers and the foundations of the bridge. Once completed though, I would think and hope that most people looking at the bridge would be oblivious to the Duplo used to build the bridge. But that said, I think it might be a few years before I get around to building the bridge as I have other projects I wish to do first. I got an interesting Duplo piece is a box of bulk Legos today. It is a big all piece, with a build in sliding door. As far as I can tell, it is from 1986. It is more likely to find DUPLO at garage sales, maybe because those often have items that kids have outgrown. Still, I often buy the sets on sale much like I do with regular lego. I picked up a few of those in a big bag of DUPLO. I suspect it was the Playhouse from '86 owing to some of the other parts with it. Kid LOVED this piece!!! Probably more for the newness/novelty, but still...he had a good time just opening and closing the door. if you want the princess related Duplo... have a fair amount that I will trade for other pieces. If you have any interest, let me know and I’ll get some pictures together. I’d be interested in trading for things we don’t have, not just blocks and cubes and such. 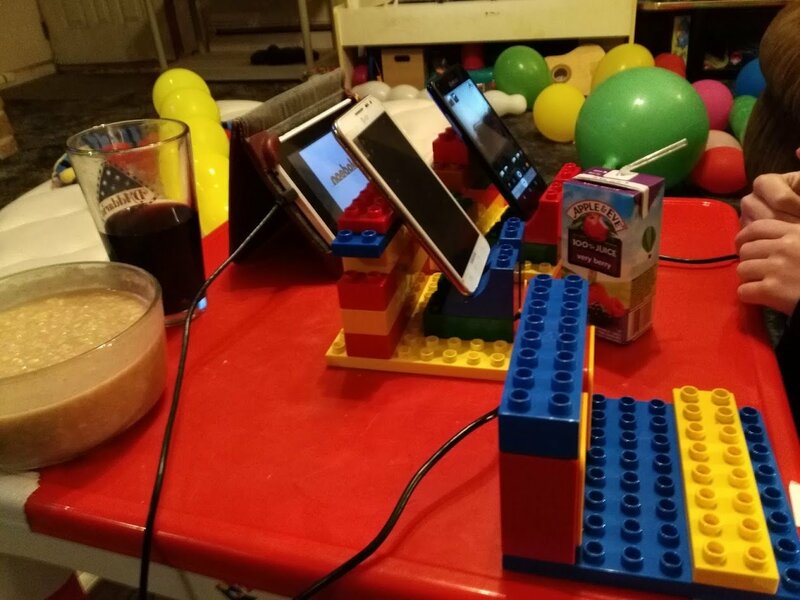 Using Duplo every day here to build stands for cellphones and tablets. The stands are evolving daily depending on which devices are being used and how they need to be positioned. I bought the recent set with Santa in it. Some of the older sets like pirates would interest me however I imagine they are rather pricey on the secondary market. What did you think of the recent Santa set? I thought it would’ve been a good addition to our Christmas collection. The wife vetoed it in favor of a friends set to add to the village, but the duplo one might still make it’s way home into our Christmas decoration box. I got the Santa set. I love it. The reindeer is adorable. The tree is so perfectly simple. And the sleigh... it's just beautiful with it's printing on the side (no stickers here). Well worth getting!! 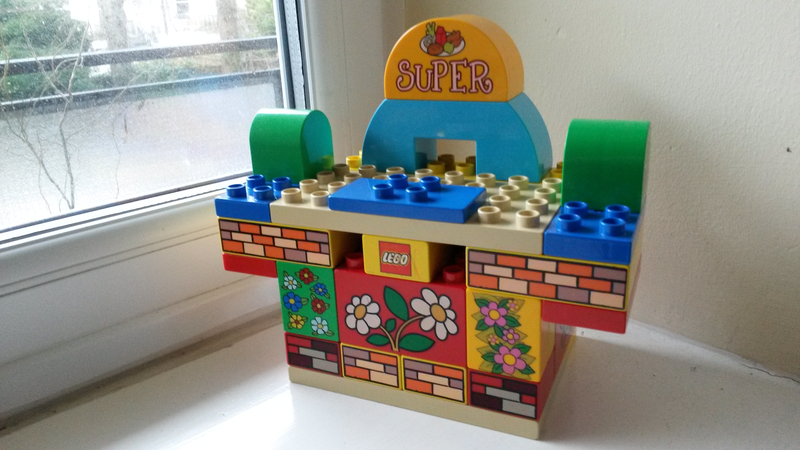 I recently found a load of Duplo in a charity shop @tallblocktoo. Duplo tends to turn up a lot in charity shops because many parents just pass it on when their kids out grow it. Good bargains for me!! Thanks for the review bookmum! Yep, that set might well end up in our Christmas decor now. I am interested in maybe getting a Duplo train set. 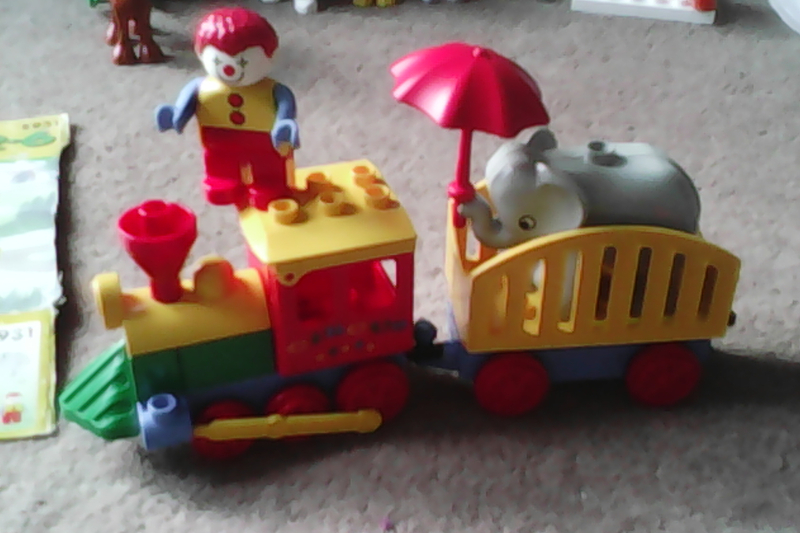 Does anyone know if the circus train I have would work on Duplo train tracks and are old Duplo tracks the same as newer ones? Thanks!! @bookmum - I think old and new Duplo track work together with cars of any age. I have a thing for Duplo, always pick it up if I see it. I collect printed 2x1 bricks and other odd bits. Managed to accumulate quite a lot of the stuff, my son has a large gathering of people and animals thanks to my efforts. Yes it will. They are the same gauge (4 wide) . The only thing to watch out for is if you mix things like the Thomas sets with battery trains. The Thomas ones have the hook at the front and the clip at the back, whereas the battery one has just a hook at the back. This means if you use the battery one to drive the Thomas one, it initially goes backwards whenever you turn it on. I hacksaw-modded one of our battery ones to attach a hook at the front and a clip at the back, so it could be used as a tender to push Thomas and pull carriages behind. The only real difference between old and new duplo tracks is the old grey / new grey change. I don't know, never had those ones. But it all went on ebay about 18 months ago. 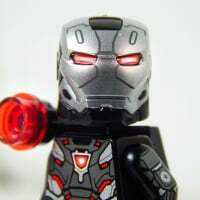 I think that you can still pick up the parts reasonably cheaply on bricklink. @bookmum If the track looks like Duplo track then it is probably compatible. I have some in the attic, but finding it will be an adventure. We had an enormous Duplo collection when the kids were small. Feel quite sad about giving it all to a friend when we decided we didn’t have room to store it for our future grandchildren. One of my favorite things about Duplo was its compatibility with regular LEGO. 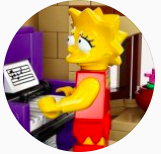 As children age up from Duplo to regular LEGO they inherit all the larger primary-colored LEGO bricks that their older siblings are now ignoring, so there's a nice middle phase there between the two systems where they can be combined. 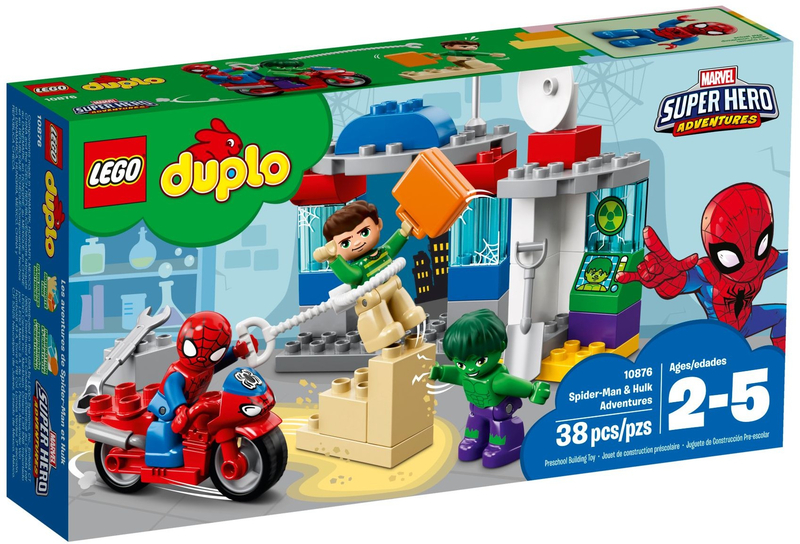 I want that Duplo Hulk so much! ^I didn't even know that existed. is it a new thing? 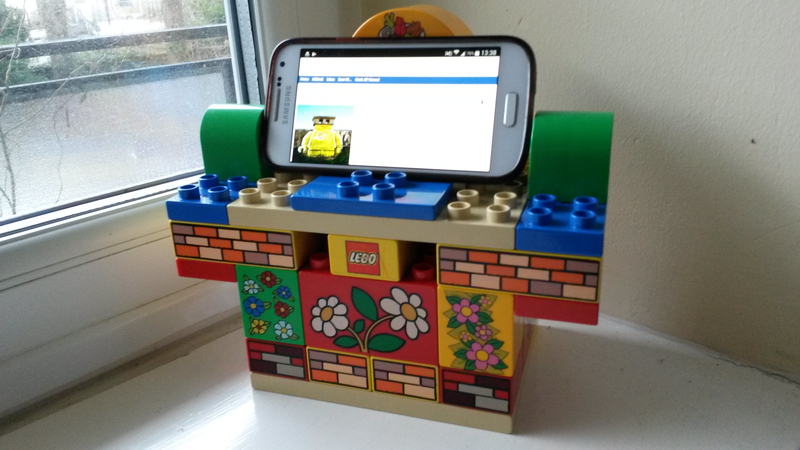 Needed a stand for ages, Duplo usage is so obvious... Thanks for the jolt. I was reading this thread yesterday (I have two young children, so it piqued my interest), then today found a complete and boxed #5653 Stone Quarry in a charity shop for £5.99. The box and instructions have seen better days, but the pieces are great. There were even a few extra bricks in the box and a handful of compatible Mega Blocks. I think the reason that Duplo can be found so cheaply is that there are far fewer AFODs (is it even a thing?) than AFOLs, so it's not hoarded as much and it's often cleared out as kids grow up. I often see it at car boot sales whereas Lego is much harder to come across. @Bumblepants That is a lovely build! The thing that amazes me is how creative wee ones can be with Duplo. My 3 year old granddaughter builds something different every day when I am visiting, and her creations are not anything I would imagine in a hundred years. Her yellow schoolbus has become a rolling palm tree farm with goats on top of the trees, a farm transit for the cows, a rabbit party bus, and a traveling garden among many other schemes. I pickup very old, cheap animals from BrickLink, and she has a blast redoing her vet clinic and pretending she is Doc McStubbins. Every morning we pour the Duplo bins on the living room floor, and at night we pack them up to put away so I don't trip on them from my base on the sofa. Because the kids don't have television, she has to build for entertainment. 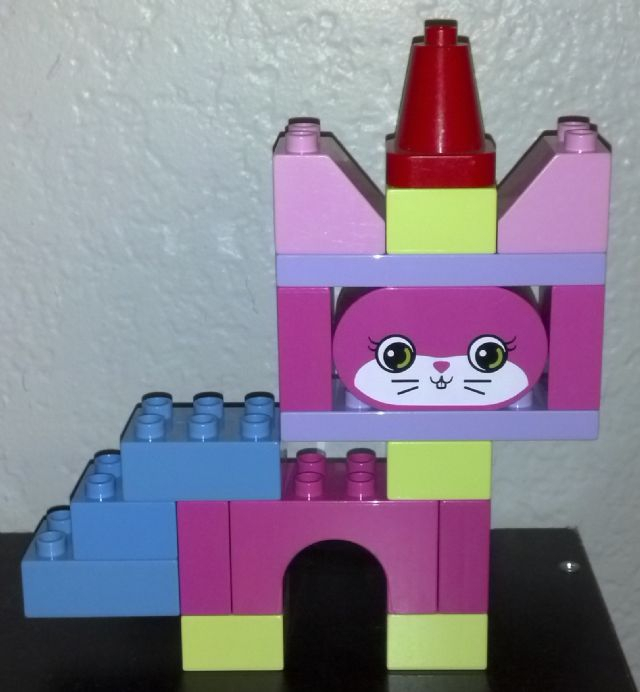 My son did not have Duplo, but his daughter adores it. So glad I began collecting it about ten years ago and enjoy building with it. I have recycled some of my oldest Duplo to a friend's home because she watches a two year old one day a week, and they love Duplo, too. It is perfect for lending to others with children because it takes abuse well. For adult builders buying new Duplo may be the best option because many of the older pieces are quite beat up. For kids, the older bricks are fine. I keep on display four huge apartment buildings built with pastel colors and love redecorating them now and then. Many of the furniture parts came from all over the globe. This build is not for kids! It is wonderful hearing how others use Duplo. It seems to me that Duplo never grow old, but they do grow on you! now i am even sadder that we gave up our duplo! love your builds, the1whitetiger! Nice! Here is a close-up of mine. I have a Duplo question for all you Duplo fans. Are the Thomas the Tank Duplo trains battery powered or push along? Thanks. Ah that explains why they seem much cheaper on ebay etc. Thanks.